Thanks for all your kind comments and birthday wishes, I had a great day! I'll share more later this week, along with some BRAKs I received. My friend Kristie and I ended up being the only two to sign up for a Kids Card swap, so this is what I made to send her. I started with a wasabi base and sponged and distressed the edges. I cut a bayou strip and sponged the edges, then crumpled it up, flattened it out slightly, and stamped the canvas background on it randomly. I cut a strip from Jersey Shore dsp, crumpled it up and smoothed it out slightly. I attached both these strips to the base. I tied one sky ribbon around the card front, adding a HPH ribbon slider. I stamped the sentiment in pumpkin, punched it out with the word window punch, and sponged it. I punched a hole in the end of the tab, threaded some crochet thread through and knotted it to form a loop. I then put the end of the sky ribbon through the loop and then tied a second knot in the sky ribbon. Are you confused yet? 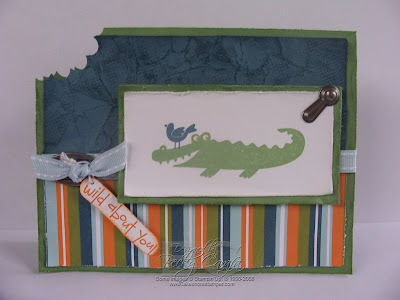 I stamped the crocodile/alligator and bird on a white piece and distressed the edges. I attached it to a wasabi piece that was sponged and distressed. I added a photo holder thingy in the corner, attached it to the card using dimensionals, and put two dots of CE on the croc/gator's eyes. For the finishing touch, I opened the card up, making sure the scallop punch was centered over the fold and the sides, and punched out a bite! This is so totally adorable!!! Love what you did with the bite out of the corner!! TOOO cute!! This is adorable!! Love the bite taken out of the corner...very clever!! Oh, my! This is just so cute! I am doing a hostess club workshop in a week with a "Punchy for You" theme and I think I might have to incorporate this bite mark punch into a card somewhere! lol! It's really adorable and one terrific idea! I love the card design and color combo too. Cute stuff. This is wonderful! What a creative use of the scallop punch! OHmigosh- that is adorable!!! Love the bite mark!! That is adorable. Too cute and creative. How clever and cute!! Love it! Adorable! I love the big bite! what an adorable card. I just love that set, and you did it up just right! love the bite! Becky, I have got to tell you that I showed this card of yours to my kids because I knew they would love it (which they did!) and a few minutes later my 6yo picked up the card I had just slaved over and BIT THE CORNER asking me if this is how she did that! I was nearly speechless- well, not quite. 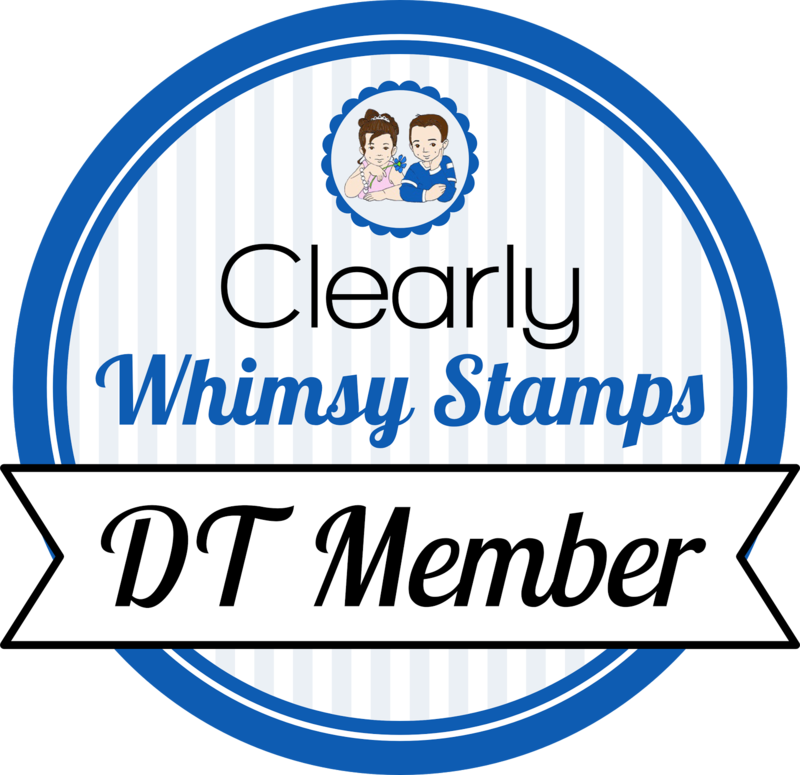 The little stinker totally knows better too- she's my stamper for crying out loud! Anyway, had to laugh. I think I showed you some love on this in your gallery, but if not, here it is! LOVE IT!! And totally plan to CASE it! I love the Wild About You set and when I saw this card I just thought it was SO STINKIN' CUTE!! I know I will have to case it for the next b-day party my girls go to. Love it!